I appeal to you, brothers, in the name of our Lord Jesus Christ, that all of you agree with one another so that they may be no division among you and that you may be perfectly united in mind and thought. To remain united as Christians we have to distinguish two spiritual elements. The first element for the unity is from the gospel to have unfeigned love, humbleness, peace, justice, living faith wisdom of God all these can be increased by rebirth in Christ, of course adding do not judge not to be judged. To become one, this can be achieved by the essential elements of the word of God like but you do not be called rabbi for one is your teacher the Christ and you are all brothers. The second way that contributes to unity is the respect to the manner of the approach of every man to God’s will. Every man can reach the throne of the Holy God through different spiritual motivation as it is religions, dogmas, organizations, baptism and worship but this is not the reason to be separated. The centuries has prove that all these have brought only bad things like fanaticism egoism as corollary to love and its results to be trivial, because they all rely life on money and drugs. We knew, comprehended, understood, insured learned that love all housed. Let us love and be certain that neither man or doctrine nor religion will be able to separate us from the love of Christ, which housed everything. If we do not perceive the love of Christ we cannot have the Spirit of God. In the case we do not have the Spirit of Christ; we will understand it fast in the moment of putting terms or labels to our fellow man in order to accompany us. In this case there is no God, the reason because we observe others life and if they do not obey us we separate ourselves. 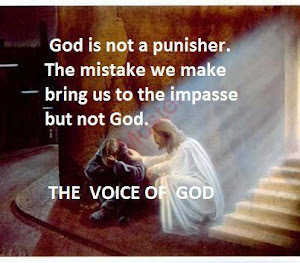 The voice of God does not impose terms or orders. Every man is responsible for himself. If he wants to leave according to Christ he will take it seriously if not he will leave the life of the world. The voice of God accepts everyone as he is. 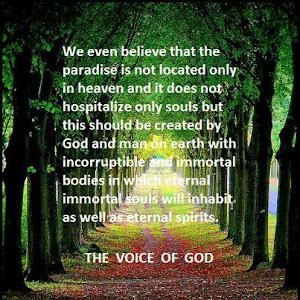 The voice of God has no partiality, gives freely anything that God has provided and has the good intention to study and complete the spiritual missing that will secure deity. The voice of God addresses to those who want to become like Christ. AMEN. For I have been informed concerning you, my brethren, by Chloe’s people, that there are quarrels among you. Now I mean this, that each one of you is saying, “I am of Paul,” and “I am of Apollos”and“I of Cephas” and “I of Christ”. Has Christ been divided? Paul was not crucified for you, was he? Or were you baptized in the name of Paul? The entire world, for centuries now, takes the action as non reborn and these actions are condemnation, slanders, personal aspirations, cunnings, rivalry, wards and many more destructive forms of behavior. These situations have divided people to nations, religions, dogmas, organizations, associations, syndicates, brotherhoods and man made a God at his measurements. After all people are divided although God through His Son brought on earth peace, love, righteousness we know very well the results among the people and specially among Christians. From the history we learned those wards has made supposedly in the name of God, till today men say I am of Paul, I am of this dogma I am of this group I belong here or I belong there focusing in a particular way of life and salvation neglecting the mercy love and righteousness of God, which saves the robber and the saint, this is out of their logic. The misconception filled the spiritual world with uncertainties, the reason is because everyone transfers and transports the kingdom of heaven back to heaven as God’s will. The easy solution, while money and medicine determine the life of all Christians. They cannot understand that all this is driven by people who stole the wisdom of god and consciously became gods or representatives of God on earth. We must understand that God donates today the biggest gift He could. God has donated to the rational being man the word of God, intermediaries in our spiritual life do not require. The intermediaries want to impose to our lives, they never become friends, always keep distances, they act like notable, they want to rule our life with lies insisting to believe that without them we are unable to live but when, by the spirit of God, we conceive the will of God and we do not enroll in our lives all those who bring the split between us then we receive merciless attacks. 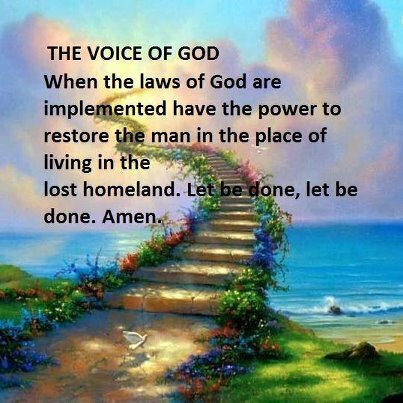 The voice of God has achieved with the grace of God to eliminate the dispute among the spiritual brothers there are no people above or lower, does not impose laws or terms to accept the man, does not intent to classify or grouping the people imposing specific targets or aspirations. We all know that when the time comes for everyone God will gather him into His family, filling his life with love which accepts each one as he is insuring freedom. The voice of God distributes freely the spiritual property that God has provided without partiality. 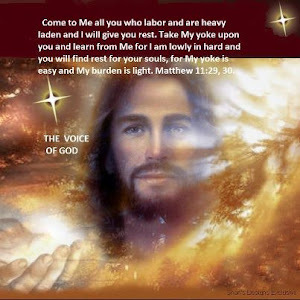 At the voice of God we all are learners of Christ. God’s people, who by the centuries has carry on various mission or performed certain deeds, at their own time, seeking salvation, each one has play a positive role of renaissance. Definitely we can draw wisdom from all these saints, the wisdom which coincides with the wisdom of God and develops love between us. 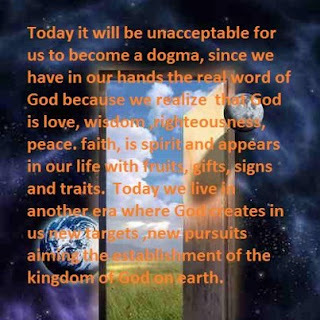 Today it will be unacceptable for us to become a dogma, since we have in our hands the real word of God, because we conceive that God is love, wisdom, righteousness, peace, faith, is spirit and appears in our life with fruits gifts signs and traits. Today we live in another era where God creates in us new targets new pursuits aiming the establishment of the kingdom of God on earth. Until today all the previous men of God did not establish the kingdom, but they specifically conceive the rebirth of man. The kingdom of God will be established by men under the guidance of the Holy Spirit filling spiritual missing. After all we will become ideal men with the personality of Christ. God will create His kingdom to those who will be heavenly called to this destiny. Father God will inspire the kingdom in the brain to those who can conceive the word spoken by His Son to become like Him. This is the reason of the existence of Jesus Christ and His gospel. The centuries have proved all men cannot become people of God for the simple reason they don’t have the same mission. God gave different things in different times, because the spiritual level of man is increasing by studying the wisdom through the good and the bad. Today is easy to abolish the existing stereotypes of the world by studying the Gospel in the healthy doctrine and to become love. Through the study of the Gospel, God will reveal the living voice of the living God in other words distinguishing men’s commandments and the Holy Spirit. Jesus said: But you do not be called Rabbi for one is your teacher the Christ and you are all brothers. Paul the apostle put elders, at that time this had to be done. Today we all have the knowledge we all study the same things, why we have the intention to become shepherds specials prophets? With pure love to God and to our fellow men let’s choose to become friends. In these verses Paul by the Holy Spirit said: Do not become of Paul do not become of Peter but Christ. Many men passed through the centuries and by the Holy Spirit wrote many spiritual books, but today we have the integral Gospel the Word of God Jesus Christ Himself. If we are of God we apply this in our lives, for those who do not like let them, saying they are God’s people either way love of God accepts all but let’s all become of Christ. It makes great impression to me living in 2012 and listening people saying I’ m going to my spiritual, I’m going to such organization, I have the truth, I do this or do the other, while my life has nothing common with the life of Christ. I think that many Christians consider cafeterias or other places as a sing because people there are talking their problems, so they create other places to drink coffees like organizations, associations, religions, brotherhood and more. Unfortunately today the organizations, dogmas, association even religions became cafeterias where discussion and speech does not differ from others; simply in the discussion the name of God is involved. They did not solve any of the mysteries, mysteries remain mysteries, repeating and perpetuating the symbolism of the mystery. So they think that they are God’s people. The one who manages the “cafeteria” he determines what sort of coffee people will drink today in view of the fact he considers himself shepherd. All dogmas for two thousand years served one sort of “coffee” and they say this is it love it or live it. My brothers, if we want to become literally people of God let’s take the Gospel in our hands, enter to sanctuary and let us study day and night the will of God until the logic of God becomes our logic and the deeds of Christ our deeds, or else will not succeed high spiritual goals like eternal life unfeigned love and living faith. Some people knew God’s will earlier than others, God’s concession; they show themselves as elite creating privet spiritual property taking out from Jesus Christ life. Continually cause fear and confusion to people imposing the impression they alone understood and hold the truth. It is clear in the word of God and to all whom love the truth can study and develop it, simply for who does not know it is easy to be a victim of exploitation. Fanaticism is a well know method of exploitation. God is using all of them and at the end will be revealed who was initiated by God and who by his ego. Let’s be careful, do not become gods to anyone and don’t let others become gods in our lives directing us. The healthy relationship between us is in the spiritual research of love for as much as the abundance of one to the lack of the others, with humbleness in the spirit of brotherhood. All these will determine the healthy reborn man of God. AMEN. Αναρτήθηκε από NIKOS στις 10:32 π.μ.